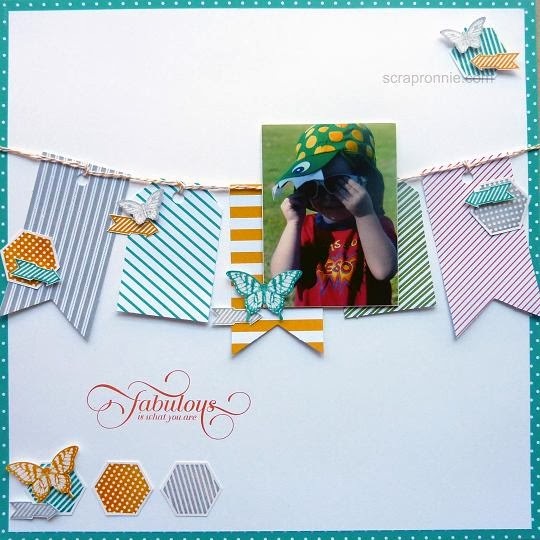 Scrap and Stamp with Ronnie: Scrapbook Saturday - Tag a Bag Tags! Scrapbook Saturday - Tag a Bag Tags! Firstly, I know it is Sunday and this post is a day late yet again. Saturdays have just been super busy lately!! Onto the layout I have to share with you today, I have used the Tag A Bag Accessory Kit to create the focal point of this page. Such a simple way to create a banner across the page! Materials: Tag A Bag Accessory Kit (130153), DSP Stack Brights (130134), Whisper White Cardstock (124302), Six Sided Sampler (130953), Papillion Potpurri (132058), Hello Lovely (130240) and Million and One (126375) stamp sets, Hexagon (130919), Bitty Butterfly(129406) and Elegant Butterfly (127526) punches, Bermuda Bay(131171), Crushed Curry (131173), Tangerine Tango(126946) and Smoky Slate(131179) ink, Clear embossing powder (109130).